Chelsea full-back Filipe Luis is convinced former team-mate Radamel Falcao is better at Manchester United than he was at Atletico Madrid. Falcao has only managed one goal since joining United at the start of September but Filipe Luis insisted the Colombian striker – who he played alongside at Atletico – is stronger than when he scored a hat-trick against Chelsea in the 2012 UEFA Super Cup. Filipe Luis considers Falcao to be “the best in the world with his head”, while he said the 28-year-old has an insatiable hunger for goals ahead of Sunday’s clash between United and Chelsea at Old Trafford. “Falcao is a better striker now than he was at Atletico for sure. He was injured and changed clubs so he wants more. He is not resting right now. He is a tiger and wants to score more,” the Brazilian defender told the London Evening Standard. “I enjoyed playing alongside him at Atletico for a lot of games. I remember him in the Super Cup, he scored a hat-trick in about 30 minutes [against Chelsea]. But he did a lot of good performances in Atletico and had a lot of good seasons there. “He is a brilliant striker. He fights for every ball and is probably the best in the world with his head. 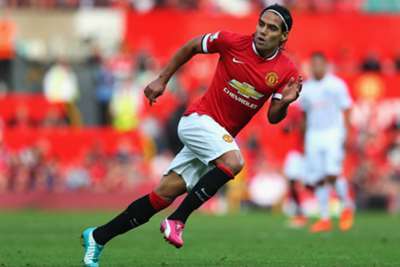 I know it’s going to be difficult but not just against Falcao – United have a lot of good players. “Will I give my team-mates any special advice on how to stop him? No. Our team is prepared for anything, not only Falcao. Manchester United have a lot of dangerous players. We have to be prepared.